She's a grand old flag and she makes for grand old American Flag bedding, too! 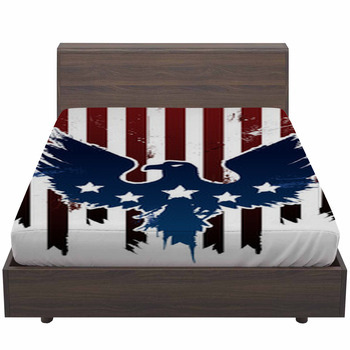 For the patriotic soul in your family, we are proud to present themed bedding that lends a patriotic flair to any bedroom. 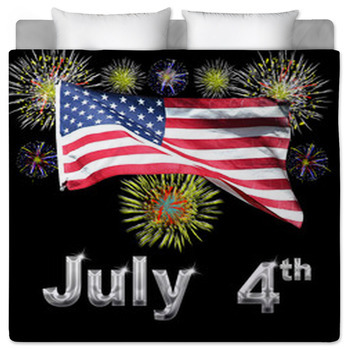 We're talking gorgeous custom size duvet covers and comforters that feature American flags flowing in the breeze and eagles standing proudly before our Declaration of Independence. 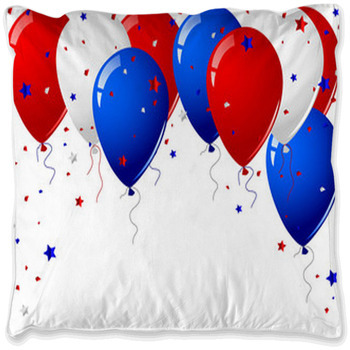 Patriots and citizens alike will feel connected to their country as they lie beneath American flag bedding. 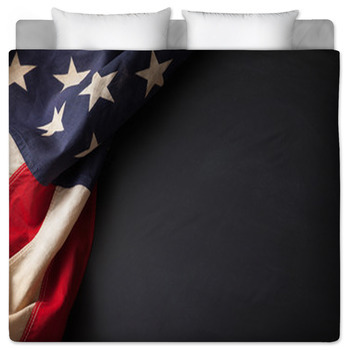 With so many American flag bedding decor options to choose from, you'll feel like you're exercising your civil rights. 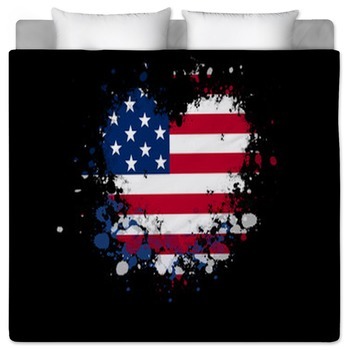 Have a heart and take a look at our American flags in a heart shape, or stay as solid as Lady Liberty with a duvet cover with her face on it. 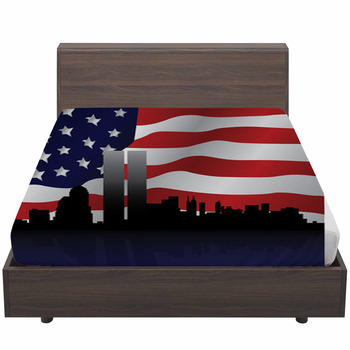 You can also customize and personalize our designs to make a look that is perfect for your individually American bedroom. Maybe you want to fly the flag but you don't have a color palette that matches the red, white, and blue. No problem, because you can make color changes to our custom designs. And if you have a younger patriot at home, why not use one of their photographs to put before a flag, adding that truly personal touch to their room. 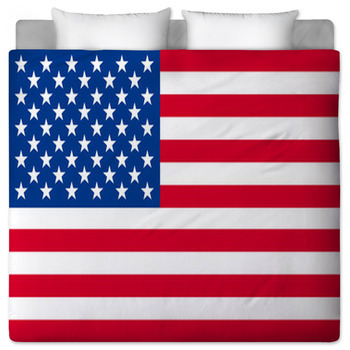 American flag bedding comes in a range of styles, products, and sizes that exemplify the melting pot of Ameican culture. 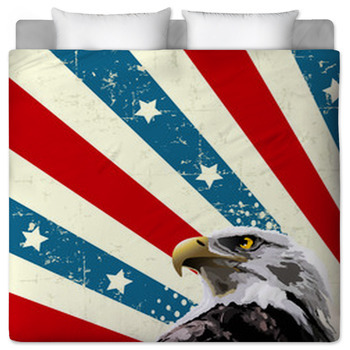 Our comforters come complete with proud eagles, our duvet covers with the Declaration of Independence make for a history lesson when you get into bed, and our pillow cases featuring the flag mean you get to lay your head on the most important American symbol while you sleep. 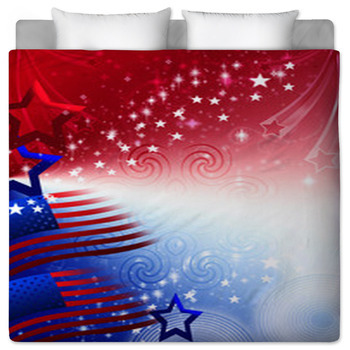 We also offer bedsheets that show various artistic flag designs for the creative types. Fortunately, there are so many images in our library that you'll be able to find the perfect designs or other flag art to create exactly the theme that you're wanting to make your bedroom beautiful. And it works well for many different rooms and color schemes. Naturally, with the flag, you'll be dealing with a lot of reds, whites, and blues. These are colors that lend themselves well to matching many other colors in your bedroom. Try for a flag theme, or a liberty theme, or even an American pastime theme. 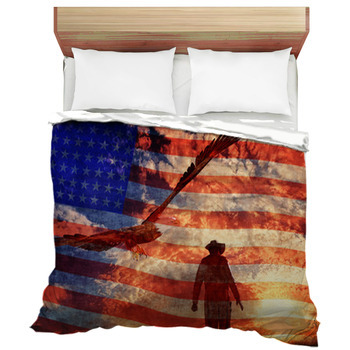 This American flag bedding is perfect for those who serve our country, whether overseas or at home. Veterans, active duty military members, firefighters, and cops will all love falling asleep with the symbols that help drive their passion and careers. 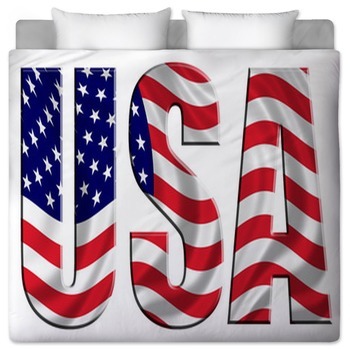 So patriots of America, unite, and display your love of country, not just on the flagpole, but in your bedroom, with one of a kind flag bedding.